Businesses that attract a large number of people and affect the congestion of the local area are considered travel hubs. To reduce the negative impacts that these groups have on the urban environment—such as traffic, increased demand for parking and more pollution—cities should analyze each case with a systematic approach and implement policies that mitigate these burdens. Problematically, many cities tackle this challenge by simply constructing additional roads in hopes of meeting demand—a solution that can actually make congestion worse. Indeed, it is not uncommon for the construction of a new shopping mall or large store to usher in additional streets or a widening of roads. An alternative to this car-centered development is the application of travel demand management (TDM) strategies, which are policies that reduce demand, particularly of personal vehicles, and offer more sustainable methods of transport which eliminate unnecessary trips. Brazil, which has yet to fully adopt the concept, has a lot to gain by implementing TDM policies. Some Brazilian cities have had public policies on travel demand management for years, such as the traffic restrictions in São Paulo that have been in place since 1997, and the parking charge on public roads established in 1987 in Porto Alegre. However, these policies fail to go far enough, and need to be integrated with other measures to be effective as congestion increases. Taking into account the great potential that companies can have to reduce traffic, below are TDM strategies that Brazilian businesses should consider exploring. One option is Trip Reduction Ordinances (TROs), which are policies that reduce travel demand through broader corporate mobility plans. Created by individual businesses, these plans specify defined goals for reducing commute-related emissions or reducing the number of commuting vehicles with a single occupant. To encourage and assist with the development of corporate mobility plans, the public sector can provide technical support through guidelines—such as the Step by Step to Building a Plan of Enterprise Mobility. Furthermore, cities can be flexible on laws that require a minimum of parking spaces for businesses, optimizing the use of available space. In synergy with TROs, cities can also pass additional policies incentivizing public transport as well as congestion charging. It’s important to note that TROs vary widely according to local context. For example, in the city of Bloomington, Minnesota, corporate mobility plans are compulsory for all companies with an area greater than 92.9 square meters, while in Minneapolis, the same rule applies for businesses exceeding 9,290 m². In San Francisco, California, TROs are necessary for businesses with more than 20 employees. In Massachusetts, on the other hand, this criterion applies to companies with a thousand or more employees. In general, according to The Better City Transportation Management Association, TROs in the US are most commonly required for companies with one hundred or more employees. In 1991, the state of Washington created the program Commute Trip Reduction (CTR) to improve air quality, reduce congestion and curb fuel use. Through data collection and the policy, many cities witnessed an adoption of more sustainable methods of commuting to work. In terms of enforcement and review, much of the success of CTR was due to an effective partnership between the state, cities and the private sector. Indeed, in 2006, employers invested $45 million into the program, more than 16 times the amount invested by the government. 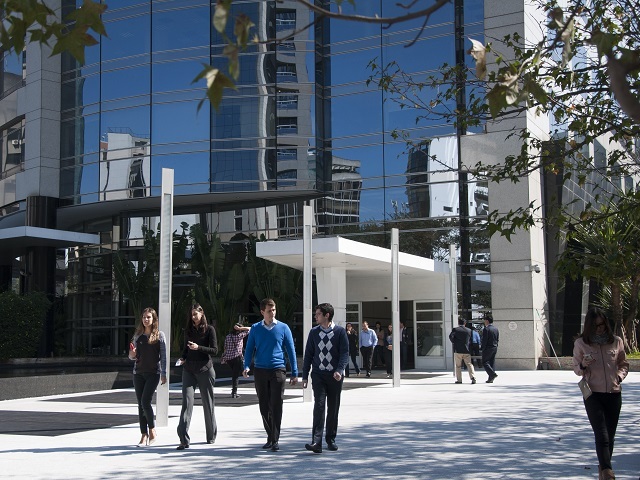 Businesses understood that by providing a benefit to their employees and reducing the demand for parking, the program boosts worker productivity. 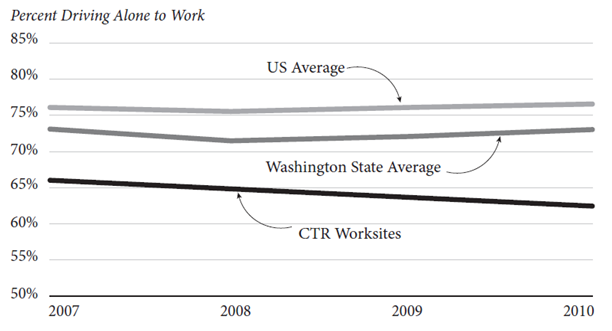 According to the Washington State Commute Trip Reduction Board, in a survey conducted between 2009 and 2010, significant progress was made in terms of employment growth and commute times. Car trips with a single occupant and miles traveled by vehicles dropped by 4.8 percent and 5.6 percent respectively.